Al Maha is a sanctuary for man and beast alike, a nature reserve rekindling the surprising life of the desert. The main resort itself takes up less than two per cent of the wild expanse in which it is cradled. Here, as part of the conservation initiative, endangered indigenous animals are being carefully reintroduced into the wild. Hence you will find yourself part of a unique population: domani and rheem gazelle, scimitar - horned Oryx, the beautiful Arabian Oryx, the rare Arabian fox, the tiny desert hare. It is this diversity of fauna, and the richness of the flora on which it depends, that so surprises visitors, and changes their notions of what the word "desert" entails. Animals are elusive of course, but the knowledgeable Field Guides will seek them with you on safari, traveling the sands as the Bedouin did, in the long shadows of dawn or dusk. Al Maha promises new experiences for even the most seasoned traveler. Have you ridden high on a camel across haunting desert plains? Have you experienced the solitude of the dunes at sunset? Have you held a falcon and later watched it soar, circle, then fall in a flash for its prey? You will, at Al Maha. The Hotel's Field Guides will help you with their expert understanding of the terrain, and the techniques they use to master it. How they drive the dunes in a four - wheel drive vehicle how, to get close to shy animals. At Al Maha you'll discover a disappearing way of life. You'll discover the weave of the sands. You'll discover ancient pursuits like archery and ancient places like Hatta and Oman. And, so long as your sense of adventure is alive, you'll discover a little more about yourself. To stand on the quay of Dubai's famous Creek is to straddle two worlds. Look up at the defiant architecture of the soaring towers, and you know that you know that you are standing in one of the most progressive cities on the planet. Yet reflected, quite literally, in their walls of gleaming glass, rare the sublime wooden dhows that line the Creek - unloading textiles, spics, rice - trading as they have traded for a thousand years. Al Maha, also, embraces two worlds: the world of comfort, indulgent dinning and private temperature - controlled swimming pools. And, at the same time, a simpler world rooted in the ethics of the Bedouin ways: hospitality, balance and respect for life. This is a world that calls to you from across the centuries. Experience the legend that is Al Maha. Emirates' Al Maha Desert Resort & Spa added to its list of prestigious awards recently by beating off fierce international competition to take the World Legacy Award 2004 (Nature Travel), one of the world's premier conservation accolades. The place took its name from the proudest of all dune dwellers - the Arabian Oryx. Herds of these spear - horned antelope would appear out of the heat haze - nomadic bands seeking this place of shelter and respite. The people named the oasis after them and "Al Maha" came to be known far and wide. But even amongst the tribes of the desert, the selfishness of one man prevailed. Wishing to control the life around him he built his camp around the water, used it selfishly, and diverted its course. The desert is an unforgiving place to those who cannot read its signs or understand its subtle warnings. Without the grasses or the palms, the vengeful sands first covered the dry rock pools, then smothered the trees, and finally buried the encampment which had strangled the flow of water from the rock. Through generations, young adventures were lost in the shifting sea of sand as they searched for signs of Al Maha. many trekked over the buried place, only to fall next to their exhausted camels, a noble fate at the end of a fruitless journey. Confounded by the disobedience of his hunting falcon, a young man followed his bird's movements over the dunes, only to see it perched on a thin branch protruding through the sand. Approaching the bird, anger turned to curiosity at seeing small green leaves sprouting from a slender twig. Knowing this as a sure sign of water below, the youth and his brothers returned to the same place and dug the layers of time away. Finally, removing a stout wedge from a crack in a rocky ledge, water bubbled out and the brothers watched as the thin stream washed the sands away, revealing the ancient walls of the camp. The brothers settled alongside the pools, vowing that never again would any man or animal of the desert be denied the source of all life. Palms and once - lost wild vegetation flourished around the ancient walls and rocky pools. The wild animals returned and the surest sign of the rebirth of this fabled place, was the return of the Arabian Oryx, after which the oasis had always be named. The Al Maha Desert resort, Dubai is an idyllic, exclusive oasis set within a 25-square kilometre conservation wildlife reserve. Arriving at Al Maha is an experience rooted in the traditions of Arab hospitality, and as far away as you can get from the concept of "checking in". You will be greeted personally by your own dedicated hostess in the cool of the spacious central building's maze of delightful books, daily magazines and newspapers, antiques and informated artworks, the ladies and men's majlis (traditional Arabic meeting place), with their fascinating antiques. 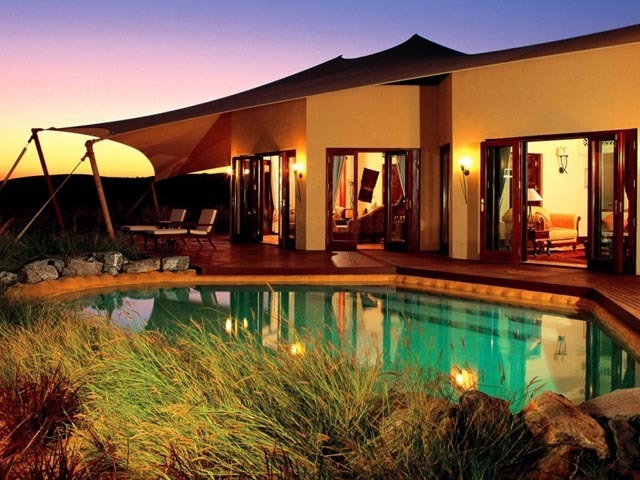 The lounge and veranda, where you can take tea in the afternoon, or sit and watch the animals at the nearby waterhole through field glasses at dusk. But your arrival is just a beginning, and or warm hospitality extends beyond a welcome. Al Maha's hand - picked service team is drawn from over 15 countries, speaks a total of over 20 languages but is focused on just a single objective: to ensure that your stay is everything you wish it to be - and more. Just a level above Al Diwaan Restaurant, is the Hajar Terrace Bar with loungers and cocktail tables. Enjoy exciting cocktails and beverages at the bar while enjoying breathtaking views of the reserve.